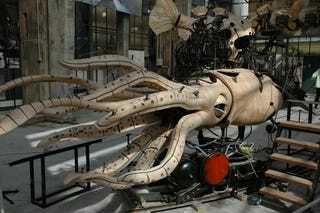 Les Machines de l'ile de Nantes are gigantic mechanical animal vehicles currently on display in the French city of Nantes. While they just look like giant models, these things are fully functioning vehicles that people can ride in. Don't believe me? Check out the video of the elephant, full of people, lurching through town after the jump, you doubter.